There were lots of fursuiting that people did, and I tip my hat to them... but with me, it's still my partial Sonic fursuit. 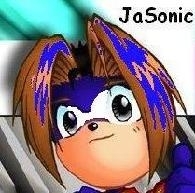 For people that was liking the music on Sunday afternoon, you would have to thank DJ Sonic (which is me also) for that. Don't know what else to say on this, except LONG LIVE WHAT THE FUR and I wish a very VERY bright future for the convention. This group is Way Past Cool, and that's NO joke! / Cette groupe est «Way Past Cool», et c'est PAS un blague!